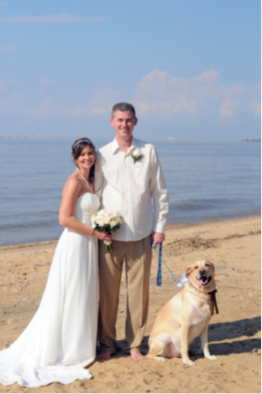 Thanks to your training class for our dog Payton, he was able to participate as ring bearer in our wedding. I don’t know what he would have done if we had not taken your class. I get compliments weekly on how well behaved he is and your class is the reason he is so good. Thanks for everything!!!! When I started with Karen Decker I knew that FINALLY I found exactly what every dog owner and rescue needs! 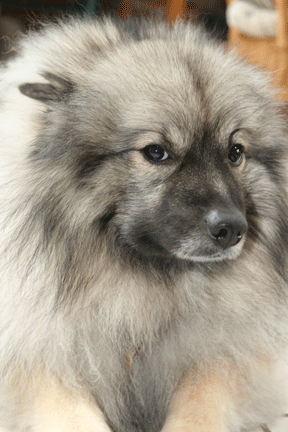 Karen shows us, exactly what to expect, when to expect it, how to achieve our goals, and bring out the best in our dogs without food rewards and clickers, with every breed. Only someone with real expert knowledge could achieve what Karen does. I observed many dogs that came to her with owners in distress, fearing their dogs behavior problems would result in euthanasia. She works with aggression, fear, lack of confidence, and by the end of her course, she has a well behaved confident dog with no more issues. I would suggest Karen to anyone that wants to get the most out of their dog. 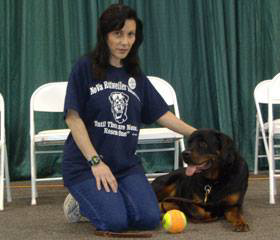 Judy Marion, Nova Rottweiler Rescue League, Inc. I recommend PUPS to everybody, regardless of their dogs’ breed, age, size, or behavior/temperament issues. The trainers teach us, Humans, how to train our dogs in such a manner that we build up our dogs’ confidence, trust, reliability, and accountability. Very simply, PUPS helps us develop and keep well-rounded, balanced, and even-tempered dogs; which in turn brings about a consistently obedient, thinking, and focused dog. Terry Robertson, Majesty Rottweiler Rescue Inc. I just wanted to tell you how right you were about Snoop Dog. He is doing just fine, more docile than ever, still very playful, and funny… I cannot believe that at one point we tried to find him a new home. Thank you for everything you did to help me see the light about him. Karen Decker along with her excellent staff, helped us with our puppy Jerzy, after he was attacked by a dog in our neighborhood. 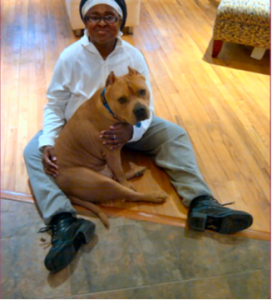 Because of her expertise, she was able to ensure our puppy would not be negatively affected by this accident. Jerzy is a well adjusted member of our family. Thanks Karen! I was just thinking and wanted to share…I think you are AMAZING!!!!!!! I don’t know….it just popped into my head all that you do to help the rescue world and I wanted to say THANK-YOU!!!! You give people hope, you take their concerns and put them on your shoulders as well so they are no alone….a true partnership. You can see the love and commitment in your eyes to help these dogs AND their guardians get to the next step Thank you. For more testimonials, visit the PUPS Dog Obedience Training Facebook page.